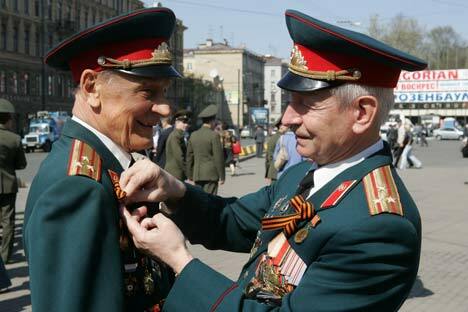 The first time I celebrated Victory Day in Russia, I was overwhelmed. I found it impossible to describe this holiday to friends and family in the United States. The closest I came was a combination of the 4th of July and Memorial Day, but more. That first year—and every subsequent year, for that matter—we went out to Park Pobedy and walked around until it was dark and then went home and watched the fireworks from our balcony. But I’ll never forget, that first year, seeing a pair of young Russian men approach a veteran from Central Asia and say to him: “Thank you for what you did for our country.” The divisions of age or ethnicity so obvious at other times didn’t matter; we were all united on Victory Day. In the midst of celebration, I thought of my grandfathers, both World War II veterans. The war had been the defining experience of their lives, and although neither of them fought with Russian soldiers or had any experience with Russians during the war, knowing that Russia was on our side affected the way my grandparents viewed the country from then on. When I first decided to study Russian history, my parents (who grew up during the Cold War) were a little concerned. Even though it was 1996, they couldn’t quite get past the idea that the Russians were our enemy. My grandmother, however, said: “They fought with us in the war,” and sang for me more than once a song popular during the 1940s about how the Russian winter defeated the Germans. I would be interested to learn what percentage of Americans actually know the day World War II ended in Europe. It isn’t something we ever celebrate. Maybe it’s because too many U.S. soldiers and sailors, my paternal grandfather included, were still fighting in the Pacific. Maybe it’s because the war didn’t become a defining element of national mythology for the United States, the way it did for the Soviet Union. Maybe it’s because all too quickly, American soldiers went on to slog through Korea and Vietnam. For whatever reason, the sacrifice of those we in the U.S. call the “greatest generation” remains mostly uncelebrated. The United States finally dedicated a memorial to World War II veterans on the Mall in Washington in 2004—not that long after the establishment of the memorial complex at Park Pobedy in Moscow, and the architecture looks much the same. Made up of white marble pillars and commemorative plaques, it isn’t particularly moving, but it is something; and every time I end up there, it makes me remember those moments at Victory Park and one thing, at least, our countries accomplished together. In honor of Willard McCoy; In memory of L.K. Churchill (1925-2007).